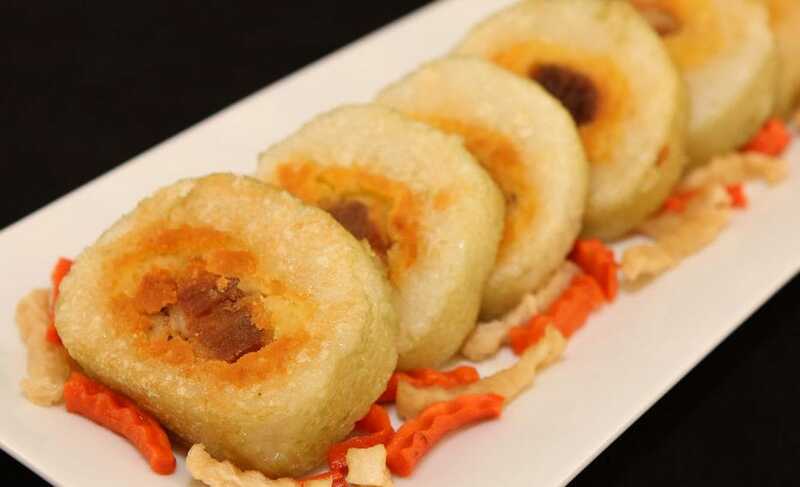 Sticky Rice and Mung Bean Cakes (Banh Tet) are must-have foods for Vietnamese New Year / Tet. There are many variations on the filling, some sweet and others savory. 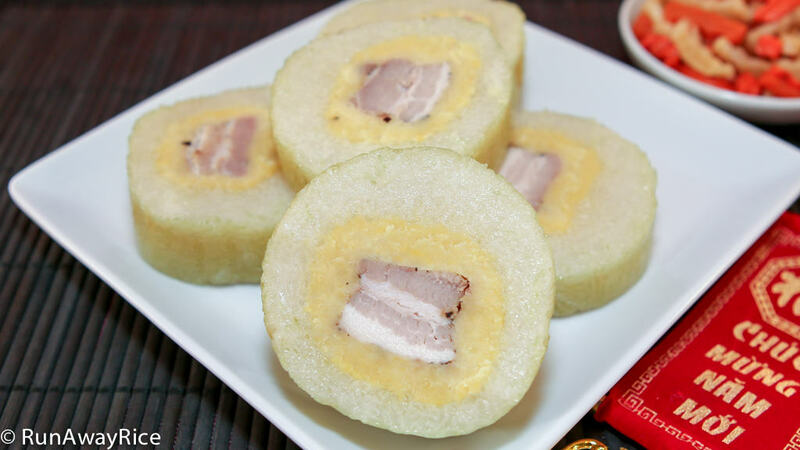 This recipe is the savory version with a mung bean and pork filling. Unlike their square-shaped siblings, Square Sticky Rice and Mung Bean Cakes (Banh Chung), these cakes are smaller, cylindrical and overall easier to make. If you live in an area with a large Asian community, you’ll find these cakes everywhere, especially around this time of the year. It may be tempting to just buy them. However, if you have the time, I encourage you to make these at home. They are just amazing when homemade! 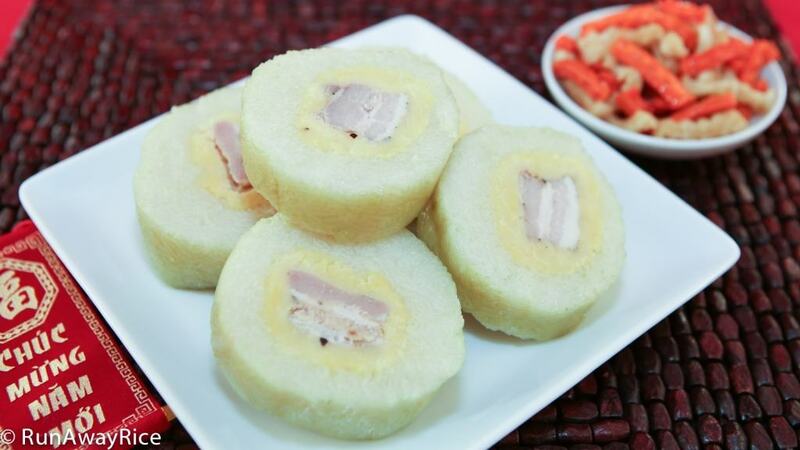 The glutinous rice is deliciously soft and sticky when freshly cooked and you can season the filling to your taste. Plus, making the cakes is a such a fun activity and a wonderful opportunity to get the whole family involved. No arguments, these Sticky Rice and Mung Bean Cakes are time-consuming to make, but, when you take that first bite of cake you’ll agree the effort was all worth it. Happy New Year!! If the mashed mung bean becomes difficult to work with, microwave for 20-30 seconds to soften. Please note I made a double recipe and that’s why there are 8 cakes in my stockpot. When tying the cakes with string, use a moderate amount of tension. The string should be tight enough to hold everything together put not so tight that it creases the banana leaves. You should be able to slide the string with your fingers if needed. The technique for tying the string is what makes the cakes so unique and eye-catching. However, if working with string is not your forte, simply make a series of simple knots around the cake. You need a pretty big pot to cook these cakes. The one I have is a 20 quart stockpot. The pot should be at least 3 inches taller than the cakes to allow room for water. If you don’t have a pot that is tall enough, you can lay the cakes on their sides and cook them this way. Be sure to use a heavy lid, bowl or plate to weigh down the cakes. The cakes need to be submerged in water during the entire cooking process or they will cook unevenly. Check the water levels every hour and add more water as needed. When adding water to the pot, only use boiling water. Do not add lukewarm or cold water to the pot. This will stop the cakes from cooking and ruin them. Some people hang their cakes after cooking to allow the water to drip out of the cakes. If you wrap the cakes in a generous amount of foil, water won’t seep into the cake and there’s no need to hang dry. Instead of boiling on the stove top, you can cook the cakes using a pressure cooker. Pressure cook on High for 2 hours. After the pressure cook time is completed, let the cakes continue cooking in the “Keep Warm” mode for at least 1 hour. More is just fine. You may not be able to stand the cakes upright and laying them horizontally is just fine. Be sure to add water to the “Max” line or enough to cover the cakes. You can place something heavy to submerge the cakes but this isn’t necessary if you use plenty of water. Store the Sticky Rice and Mung Bean Cakes at room temperature for up to 2 days. Refrigerate for up to 2 weeks. Freeze the whole cakes for up to 6 months. To enjoy again, allow to come to room temperature and warm in the microwave using Low power. Have lots of leftover cake? A scrumptious way to enjoy leftover Sticky Rice and Mung Bean Cakes is to pan-fry them until they are golden brown on both sides. Cut the pork belly into 4 (1 inch) wide strips and then trim so each strip to 5 inches long. Optionally, remove the pork skin and discard. Combine the pork with ground black pepper, sugar, 1/2 tsp salt, minced shallots and fish sauce. Marinate in refrigerator for at least 1 hour. Lay a piece of plastic wrap on the work surface. Take 3/4 cup mashed mung beans and divide in half. Spread out each mung bean half into 5 inch long sections. Place a piece of marinated pork on top of one of the mung bean strips. Place the other mung bean strip on top. Using your hands, press the mashed mung bean around the pork. Roll and shape into a log. Wrap the log in plastic wrap. Repeat the above steps, making a total of 4 logs. Measure the logs and make sure they’re approximately 5 inches long. Freeze the filling logs overnight. Tape together the 2 sheets of 8 1/2 x 11 inch paper to form an 11 inch square paper template. Thaw the banana leaves at room temperature for at least 1 hour. Gently unfold and separate the banana leaves. Using the paper template, cut out 12 sheets of banana leaves. (You’ll need 3 sheets of banana leaves per cake). Cut a few extra sheets just in case some tear while washing. Clean the banana leaves by washing both sides in hot water. Wipe both sides of the leaves dry with paper towels. Moisten 2 large sheets of paper towels and place the cleaned banana leaves between the towels. Place the cleaned banana leaves back into the original plastic bag and then seal with tape. Refrigerate the banana leaves until they’re ready to use. 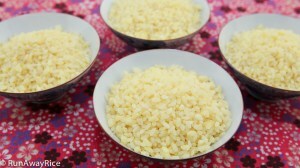 Wash the glutinous rice by rinsing with cool water until the water is mostly clear. Fill the basin with cold water and let the rice soak overnight. Remove the filling logs from the freezer. Rinse the glutinous rice with cold water one more time. Drain in a large colander. Toss the rice in the colander to remove any excess water. Add the remaining 2 tsp salt and combine with the rice. Place a 16 inch string vertically on the work surface. Place the first banana leaf on the work surface with the shiny side down and veins running horizontally. Place the second banana leaf on top of the first in the same way. Place the third banana leaf on top of the other 2 leaves with the shiny side up and veins running vertically. Place 1/2 cup glutinous rice on the center of the banana leaves. Spread out the rice so it’s 1/4 inch high and just a bit bigger than the filling log. Place the filling log on top of the rice. Bring the banana leaves up and hold together with one hand. 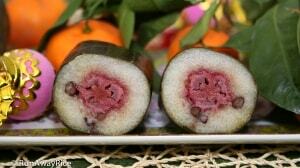 Add another 1/2 cup glutinous rice on top of the filling log. Using a spoon, add more rice to the sides of the cake. Smooth out the top, encasing the filling with an even amount of rice. While holding the top portion of banana leaves, wrap the bottom portion securely around the log. Bring the top portion of the leaves down and wrap firmly around the cake. Tie the string around the middle of the cake to secure in place. Fold the leaves over on the one end and stand the cake up. Pat the cake with your palms to settle the rice. Add 4 heaping tablespoons rice to the end, cover the filling. Fold the banana leaves (like you would a present) covering the end completely. Flip the cake over, standing it on the folded end now. Repeat the same process of adding rice and folding the banana leaves for the remaining end. Continue with these same steps until all 4 cakes are made. Wrap the cakes with a generous amount of aluminum foil. Transfer the cakes into a 20 quart stockpot standing each cake on its end. Fill the pot with water until it almost covers the cakes. Place a heavy lid or plate on top of the cakes. Add more water until the cakes are completely immersed in water. Cover the pot and bring to a boil using High heat. Reduce heat to Low and cook for 4 hours. After boiling for 2 hours, flip the cakes. After 4 hours, carefully remove the cakes from the pot using tongs. Remove the foil and rinse each cake with cold water. Dry the cakes with a kitchen towel. Wrap each cake in plastic wrap and allow to cool for 4 hours. 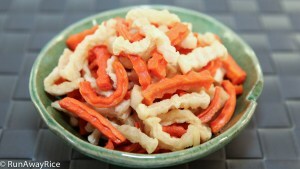 Enjoy the Sticky Rice and Mung Bean Cakes with savory Dried Carrot and Radish Pickles. Store the Sticky Rice and Mung Bean Cakes at room temperature for up to 2 days. Refrigerate for up to 2 weeks. Freeze the whole cakes for up to 6 months. 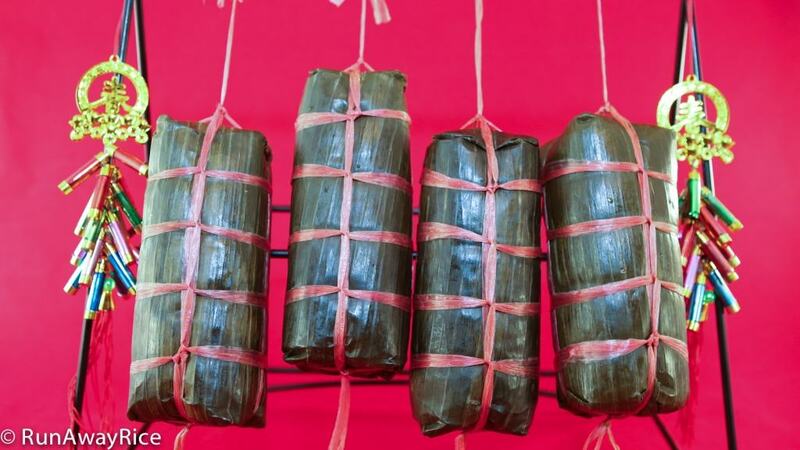 Sticky Rice and Mung Bean Cakes (Banh Tet) are must-have foods for Vietnamese New Year / Tet. There are many variations on the filling, some sweet and others savory. This recipe is the savory version with a mung bean and pork filling. Unlike their square-shaped siblings, Square Sticky Rice and Mung Bean Cakes (Banh Chung), these cakes are smaller, cylindrical and overall easier to make. If you live in an area with a large Asian community, you'll find these cakes everywhere, especially around this time of the year. It may be tempting to just buy them. However, if you have the time, I encourage you to make these at home. They are just amazing when homemade! Measure the logs and make sure they're approximately 5 inches long. Thaw the banana leaves at room temperature for at least 1 hour. Gently unfold and separate the banana leaves. Using the paper template, cut out 12 sheets of banana leaves. (You'll need 3 sheets of banana leaves per cake). Cut a few extra sheets just in case some tear while washing. Refrigerate the banana leaves until they're ready to use. Place 1/2 cup glutinous rice on the center of the banana leaves. Spread out the rice so it's 1/4 inch high and just a bit bigger than the filling log. Place the filling log on top of the rice. The glutinous rice called for in this recipe is generous and you may have some leftover. I adjusted the rice to consider several important variables: 1) brand of rice 2) soaking time 3) size of filling logs 4) amount of rice preferred in cakes. Each cake uses approximately 2 cups hydrated glutinous rice. You can add up to another 1/2 cup per cake and have enough rice for all 4 cakes. You need a pretty big pot to cook these cakes. The one I have is a 20 quart stockpot. The pot should be at least 3 inches taller than the cakes to allow room for water. If you don't have a pot that is tall enough, you can lay the cakes on their sides and cook them this way. Some people hang their cakes after cooking to allow the water to drip out of the cakes. If you wrap the cakes in a generous amount of foil, water won't seep into the cake and there's no need to hang dry. Instead of boiling on the stove top, you can cook the cakes using a pressure cooker. Pressure cook on High for 2 hours. After the pressure cook time is completed, let the cakes continue cooking in the "Keep Warm" mode for at least 1 hour. More is just fine. You may not be able to stand the cakes upright and laying them horizontally is just fine. Be sure to add water to the "Max" line or enough to cover the cakes. You can place something heavy to submerge the cakes but this isn't necessary if you use plenty of water. 1. How many banh tet can I fit in an 8 qt instant pot? 2. Do I fill the instant pot with boiling water or room temperature water? Does it matter? 3. What is the cooking time for it? I see from the recipe you put 2 hours plus 1 hour natural release. However from the comment section of your banh chung I think you mentioned 90 minutes with 90 minutes release? Thank you so much Trang. 1. 4 banh tet will fit in the 8 quart instant pot. 2. Use boiling water when possible. It reduces the pressurizing time as part of this time is heating the water to create the pressure. Especially with these cakes, I recommend using boiling water. 3. The banh tet is about 1/3 larger by volume than the banh chung and so the cooking time is longer. These cakes can’t be over-cooked but can be under-cooked so I recommend erring on the side of more time rather than too much. Good Luck! I look forward to hearing about your results! Hi Trang, I just want to thank you for the recipe & your wonderful videos. I made banh tet for the first time, your explanations & how you organized the recipe really gave me the confidence to make them. They turned out great! I cooked them in the Instant Pot for 80 Minutes on High Pressure and did a 50 NPR. Happy New Year! Hello Chi Trang, this is my second year making them following your recipe and my family loves them so much I can’t make them fast enough. I am cooking on the stove and with the pressure cooker. It’s like a banh tet factory at my house this year…lol. I really appreciate all the details you provide in your recipes. They’re so helpful and easy to understand. 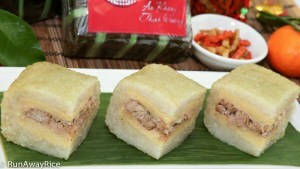 Chi Trang oi, is the short grain glutinous rice interchangeable? Hi Ann, the long-grain is traditionally used but the short grain is just fine. Good Luck! Thank you very much for your prompt reply! This is the second year that I make banh tet. I promise my mom and my mom in law the vegetarian ones for ‘cung’. I prefer to make my own because I don’t put coconut milk in the grain. As always, I know I speak for most of us when I say thank you for all the effort you put into sharing the recipes and directions with all of us. Happy New Year to you and your family! That’s wonderful you make vegetarian banh tet for your family. I’ll bet they just love them. I truly appreciate your interest and support for my blog. Happy New Year to you and your loved ones! After boiling Banh tet for 1 hour, 8 of them to be exact, I realize that I forgot to wrap them in foil!!!! I could just kick myself! Please tell me that it’s ok? This is what I get for waiting until the last minute ! The foil is an extra measure in case the banana leaves split or tear during wrapping. Some varieties of banana leaves seem to be sturdier than others while others split badly when making the cakes. I hope your leaves were strong in which case the foil is optional. Good Luck! I hope they turn out perfectly for you! Thank you chi Trang for your unlimited wisdom! I fished them out after 2 hours and wrapped them in foil. Would you believe only one split a tiny bit! I was able to deliver the vegetarian Banh tet to my mom and my mom in law today. It’s may sound a bit corny but I do feel a sense of accomplishment! By the way, for the vegetarian ones, I did not add any spices to the mung beans so I hope that’s ok. Thank you for bringing a lot of smiles to our faces! I hear you on that one chi Trang! Trang lam banh te’t sao thay de qua. Minh se thu de kip lam cho te^’t. Em muốn luộc bánh tét trong pressure cooker but I don’t think I can put it in vertically. Em có thễ nào để nó sideways được không chị? Will it affect the cake in any way? Placing the banh tet sideways in the pressure cooker is just fine. It won’t affect the cake. Just be sure to cover the cakes with water when in the pressure cooker. Good Luck! Thank you for your reply. I made bánh tét a few days ago and they were awesome! I want to make it again this weekend and I wanted to xào nếp. Do you have a recipe for how much nước cốt dừa and nước lá dứa to add? Thanks again for your recommendation. When you say 4 cups soaked glutinous rice, does that mean we measure 4 cups of rice and soak it or soak it and measure 4 cups of rice? Thanks so much for your time and recipe, they always come out great! “Soaked” means hydrated. Soak the rice and then measure 4 cups. Good Luck! Help please! I cooked 2 Banh tet in my 6 quart pressure cooker for 2 hours and let them sit untouched for 90 minutes. When I unwrapped one of them, one side has a bit of hard sweet rice. Do you think I should have refill water or turned the cake after the first hour? I would love to try making this again but only after I find out what went wrong first. Thank you for your time. There’s no need to rotate the cakes when using the pressure cooker. The high pressure heat should evenly circulate the cooker without you having to turn the cakes. Can you think of anything different about this one side of under-cooked cake? Was it covered completely with water? Was there more rice in this cake than the other? Did you use an electric or stovetop pressure cooker? Thank you for your reply chi Trang! I used a stove top pressure cooker. I followed the manual direction as to only fill the water up to half of the pan only but that’s direction for American food only isn’t it? I’m so new at cooking that any help or suggestions you can give me is very much appreciated! Maybe I should have put a plate or something heavy over the 2 Banh tet so that everything is covered completely? Thank you very much for your time. Have a great weekend! Thank you chi Trang! Your help gives me confidence to try making Banh tet again! I’ll try again when i can get my hands on more banana leaves. Thank you for sharing your recipe! Do you happent to know if the red/pink string is toxic? I don’t think it’s toxic but if you’re concerned, substitute with cooking twine. Good Luck! So I love the tips and the video! Thank you so much!!! Wondering for freezing. How do you reheat them? Steam them again frozen or bring it from freezer to refrigerator and then warm it? Sorry. Silly questions but has to figure out how you do it. Thank you! Not a silly question at all. 🙂 For the frozen cakes, thaw in the refrigerator. Warm slightly in the microwave or by steaming. You can also thaw quickly using the microwave’s defrost function. Hope that helps!